The Cumberland & Dumfriesshire Farmers Mart had forward 4,042 Store Lambs and Feeders at their Weekly Sale at Longtown on Tuesday 6th December, 2011. A similar entry met a furious trade with numbers short of requirements. 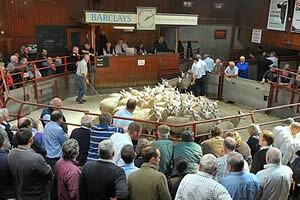 Top was £91.50, £90.50 for Texel lambs from Ridley Stokoe, others to £88.50 Netherplace, £85.50 Carslae & Keld Head. Beltex £80.50 Greenside; Charollais £85.50, £82.50 Carslae; Suffolks £85.50 Carslae, £81.50 Willowford; North Country Cheviot £82.50 Bradley, £79.50 Hownam Grange; Greyface £79.50 Wanwood Hill & Blakelaw, £77.50 Midtodhills, £76.50 Peter House; Lleyns £72.50 Chipknowe; Roussins £75.50 Castlefairn; Blackfaces £89.50, £78.50 Row, £71.50 Bennetsfield, £71 Ramshope; Swaledales £65.50, £60.50 Blakelaw. Cast ewes to £85.50 Knells and hill types £73.50 Spadeadam for Blackfaces. Cast rams to £59 Spadeadam. The 894 Hill Cheviots were a fabulous trade. Top was £87.50 Hartsgarth, £74.50 Grains Cottage, £73.50 Glendinning. Breeding sheep met a strong enquiry with trade very good. Top was £80 for Texel x Blackface gimmers from Airds of Balcary, who also sold correct Blackface ewes at £70 (2) and £68.50 all been running with Leicester rams since Mid October.